Stephen M. Williamson, Jr. co-owns Earth Right Farms, Inc. with wife Treva and parents Steve and Nancy Williamson. He was born and raised in Kenansville, NC where he and Treva raised their three children, Stephene, James David and Paul. 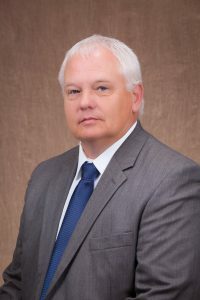 Williamson grew up working on the family farm and after graduating from James Kenan High school he attended Campbell University and received his bachelor’s degree in business administration. Williamson then began working with National Spinning Co. and continued farming until 1996 when he began farming full time. Earth Right Farms, Inc. produces wean pigs and finished hogs for Smithfield foods and Goldsboro Milling along with cattle, corn silage and hay. Williamson has served the North Carolina Pork Council since 2012 and was president in 2016. Williamson is also a member of the North Carolina Cattlemen’s Association and the Coastal Carolina Cattlemen’s Alliance. Williamson is actively involved in the community and serves on Duplin County Events Center steering committee, Duplin Agribusiness Fair committee and has served on the Kenansville Town board. Williamson is a member of Kenansville Baptist Church and serves as a Deacon and chairman of the personnel committee. Williamson enjoys spending time with family and friends. The major issues facing the pork industry today are public perception, international trade and the threat of foreign animal diseases. What do you think should be the main goal of the Pork Checkoff and National Pork Board? The main goal of the Pork Checkoff and the National Pork Board should be to continue its purpose of promotion, research and education. The We Care℠ principles are an excellent example of how this organization has provided something that every producer no matter the size can implement. The National Pork Board plays a very important role in the continued success of the US Pork industry. Having been a farmer for over 30 years I believe it is important to serve the industry that serves you.